Cinematic Paradox: "You're in love with a fantasy." "You're in love with a fantasy." Starring: Owen Wilson, Rachel McAdams, Marion Cotillard, Kurt Fuller, Mimi Kennedy, Michael Sheen, Nina Arianda, Carla Bruni, Alison Pill, Corey Stoll, Tom Hiddleston, Kathy Bates, Adrien Brody, Léa Seydoux. NOTE: This probably has spoilers in it. But by now you should have seen the film, really. If you haven't, I suggest you do straight away. Let's face it: all of us, at one point or another, have wished that we were born in another era. I myself would have loved to have been around during the transition from silent to sound cinema, living in Hollywood. Gil Pender (Owen Wilson), Woody Allen's latest hero, wishes that he was around in 1920's Paris. While he accepts that he could never go there, he seems intent on creating a life for him and his fiancée Inez (Rachel McAdams) similar to his dream, and insists that they should stay in Paris forever, where they're currently on holiday. Gil is in love with this city, and decides to take a stroll at midnight. He is picked up by a 1920's style car, and transported to the world he has dreamed of. Along his journey he meets people like Scott and Zelda Fitzgerald (Tom Hiddleston and Alison Pill), Ernest Hemingway (Corey Stoll) and Salvador Dalí (Adrien Brody), who all help inspire him while he is writing a novel. Gil goes back to this place every night at midnight, and ends up falling in love with Adriana (Marion Cotillard), who wishes that she was around during the La Belle Époque, which she thinks is the Golden Age of Hollywood, as opposed to 1920's Paris. 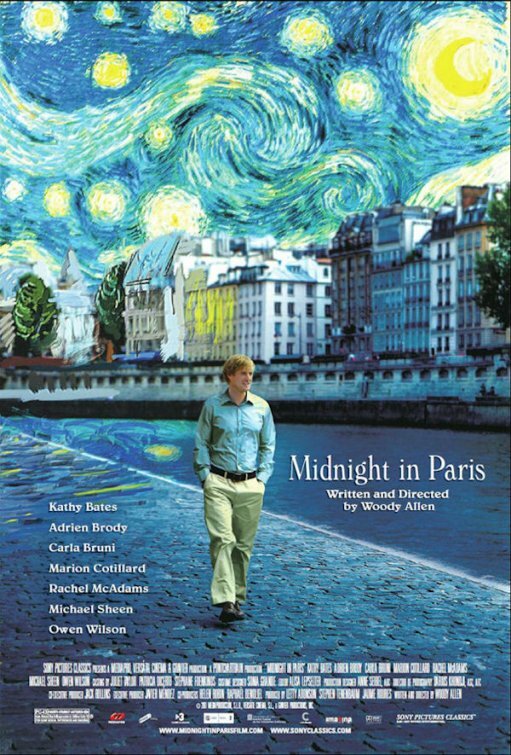 Midnight in Paris is a film that comes across as a nice wee romantic comedy, not too out of the ordinary for Woody Allen. But really, this movie is comparable with Inception. Well, kinda. As Gil is transported to his dream world, it's almost like a second layer of reality that may have been created for him by a higher power. However, a Woody Allen film being a Woody Allen film, I never actually thought of it as some sort of sci-fi film, although it could have been if the timeslip was explained a little more. But it's because the timeslip isn't explained at all that we can all sit back and revel in the true magic of this film. 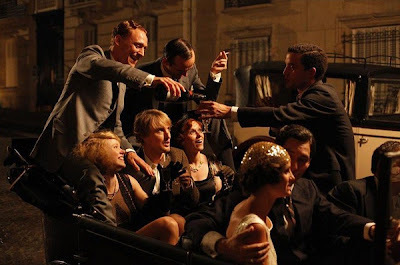 In fact, the one word that could probably describe Midnight in Paris the best is: magical. Everything about it is sheer and utter magic. The way that Allen intertwines such famous literary and artistic Gods into little old Gil Pender's story of a search for inspiration is something that is so different and something that we could probably all connect with. I mean, imagine that...meeting the guy who wrote The Great Gatsby even though he had died long ago. What would you do? And then what would you do if Ernest Hemingway offered to give your book to Gertrude Stein (Kathy Bates) to have a look at? It's a magical world that Allen creates, and it's one that even though we can't go back in time like Gil, it still inspires us. That's because Allen reminds us of the greatness that once existed in the likes of Fitzgerald, Hemingway and Dalí, and ultimately says that there is nothing stopping us from achieving greatness like they did. Along with that theory, Allen also shows us that while nostalgia is good, it's best that we not live in the past. Early in the film, the 'psuedo-intellectual' Paul (Michael Sheen) says that Gil's want to be living in 1920's Paris is "the erroneous notion that a different time period is better than the one ones living in - it's a flaw in the romantic imagination of those people who find it difficult to cope with the present." Allen explores the fact that while everything in 1920's Paris is magical and everything goes swimmingly for Gil there, everyone will always be dissatisfied with the present but we should really stay with it. He does this through the character of Adriana, who lives in the 'golden age' that Gil loves so much, but is quite dissatisfied with what she has there and wishes she lived in a different time, which she thought was her 'golden age'. Gil comes to the conclusion that the present is "a little unsatisfying because life is unsatisfying." I couldn't think of anything more true. As Paul said, "nostalgia is denial - denial of the painful present." Yes, we all like to imagine times that we don't and can't live in are far better than the present. And maybe the world that Gil found was one he was happier with. But life is not perfect, and nostalgia is one of the ways that we can try and forget that fact. Perhaps the time we live in will be a 'golden age' for someone. Isn't it all very magical? Now, I've never been a huge fan of Woody Allen, but in saying that, I've only watched his most recent works, which aren't really that great. Midnight in Paris is his very deserving biggest box-office hit, and being the 41st film in his career, he may have hit the jackpot here. 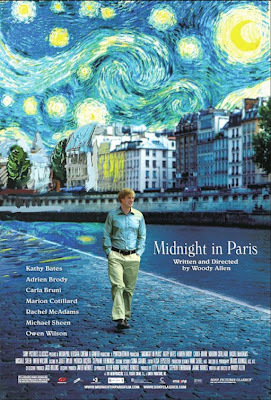 Of course, I can't really say that much as I haven't seen any of his classics like Annie Hall or Hannah and Her Sisters, but Midnight in Paris is most definitely my favourite of his work, and possibly the most enchanting piece of work he ever could come up with. As for the acting, it's all very good, just like any of the other Allen ensembles there have been. The cast is split into two parts: the present and the past. Owen Wilson does surprisingly great work as Gil. After years of hack comedies and a lot of voice-work, he has finally been in a project which allows him to be as serious as he is nonsensical, and it works. Rachel McAdams, who starred opposite him in Wedding Crashers in 2005, kinda hints at a more grown up version of Regina George in Mean Girls, but just slightly more intellectual. Michael Sheen is the guy we love to hate, and Carla Bruni has a small but charming role where she butts heads with him. As for the 'past cast', the large majority have to play real figures in history, even if only for a short time. Tom Hiddleston, Kathy Bates, Alison Pill and Corey Stoll (who is really good) all do delightful work with their famous characters. To be honest, I loved Adrien Brody as Salvador Dalí the most, mainly because I've always had a strange aversion to Dalí's strange nature and his truly beautiful work, and Brody did a great job of bringing him to life. Plus, "I see a... rhinoceros" is probably going to be my favourite line for the year. Marion Cotillard completes the cast being the charming love interest, who Gil essentially finds a kindred spirit in. She's as lovely as ever, looking as pretty as a picture all of the time. The love story between her and Gil was absolutely enchanting, which makes up for most of the reason why this movie is so lovely. I'm actually quite surprised that I managed to actually write a review on this film, because if I had my way I would have just written "I LOVE THIS MOVIE" 5000 times and be done with it. If this film does not get nominated for Best Picture, I will be severely disappointed. It's definitely my favourite movie that I've seen this year thus far! It's my favourite too this year, thus far. You know I get what Woody Allen is trying to show through this film, but gah I can't help romanticising the past. I am so like Gil, it's ridiculous. And I don't know... I refuse to believe this is some sort of dream state he is in. I believe in the magic of Paris and oh this film is just so lovely. I loved everyone in this. I think among the past people, Brody, Pill and Cotillard are my favourite. Wilson did a brilliant job of being Woody's latest doppelganger. I love Woody Allen films. If some day I do end up writing scripts, he will definitely be a huge influence in my writing. I suggest you watch Purple Rose of Cairo if you haven't already. That's my favourite Woody film, and it is as magical, if not more, than MiP. MiP ofcourse has become my second-most favourite film of the wondrous nervous geeky brilliant filmmaker. Owen Wilson is an interesting character. When he is in a striaght comedy he is absolute crap and I can't stand him. And yet put him in something quirky like The Darjeeling Limited and he excels! I will definitely being seeing this because I particular like Woody Allen. Sure he hasn't been in top form for some years now but to my mind a second tier Allen film is far superior to many other directors. I really really liked Whatever Goes even though it was generally maligned. Allen does quirky like no-one else and I like quirky. It takes a great deal of skill to pull off and Allen does it incredibly well when he is on form. This movie was excellent! I love your review for it. And wasn't it great that they remembered to include Man Ray? 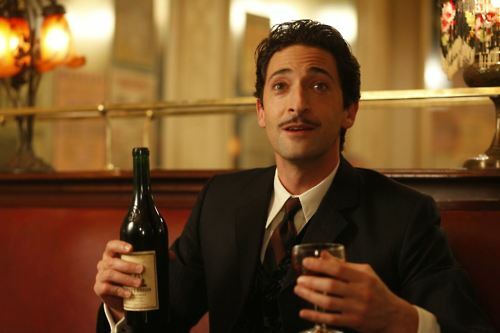 Adrien Brody did Dali's crazy eyes perfectly! Didn't read your review 'cause I'm going to see the movie next week (it will run at the repertory, only... man, multiplex theaters are becoming worse). I'm so excited for it! Though, you wrote at tumblr that you can't believe there's a place like Paris and not everyone lives there, and I must say... have you ever been to Paris? I mean, it's a wonderful city, indeed, but I was just shocked when we went there. Many parts of it are so beautiful that you think you'll get blind when you continue looking at them, while others are so... ugly, stinking and... pervert that you want to run away really fast. I don't think I could live there for more than a few years. My golden age would be the 1970s. Oh, I just love this film. I loved Brody as Dali, "The tears of a rhinoceros". That got me every time. Plus, I loved the moments where Gil schooled that intellectual-douchebag Paul on art. I hate those guys. They're nothing but easy targets to be owned. I loved this movie beyond words. My favourite part, which most people wouldn't have picked up on, is where Gil meets famous film director Luis Bunuel and gives him the idea for what will be one of his most famous films, THE EXTERMINATING ANGEL. Hahaha my mouth dropped open in that brief moment, it was definitely Woody Allen at his cheekiest, paying homage to a famous filmmaker who obviously had an influence on him. It certainly took its time to get to your shore so I'm glad it was worth the wait Stevee! Typically, being light and fluffy is pejorative when it comes to most movies but in the case of this one, it only makes the story that much more charming and whimsical. And I loved that it wasn't cynical or dark, which is kind of a change for Woody Allen. Nikhat - I refused to believe it was a dream state too. I thought it was so real! I will watch Purple Rose of Cairo, along with his other older films. I must admit, I do like his style and I would like to write movies just like them. Well, especially like this. Brent - Well Owen Wilson is really good here, so I wouldn't miss this opportunity. It really is great...definitely go see it! Dan - It's great that everyone was included! Haha. Mette - I hope you like it! I have never been to Paris. I've never been anywhere out of NZ, unfortunately. I guess, like every city, it has its flaws! Steven - I really like taking down psuedo-intellectuals. I have a friend like Paul, and I often do what Gil did. Haha. Tyler - My mouth dropped open too. That was really cheeky of Allen, but really cool! I quite would like to see The Exterminating Angel now! Castor - Gosh, I KNOW! I liked that it wasn't cynical or dark...it was the complete opposite! Which was awesome. I enjoyed this film too, and hadn't really thought of the science fiction angel, although of course that is what it is. I hope that it makes it into the best picture race, but am a little worried that its early release (in the states) might hurt it. But the screenplay nomination is probably guaranteed! Great review and lovely blog all together! NeverTooEarlyMP - I think that it might still get a chance even if it had an early release. I mean, that worked for The Kids Are All Right. Then again, since they're not doing 10 nominees this year or whatever, *that* will be the thing that hurts its chances. But really, there haven't been that many great movies out there, and this is still among the highest rated for the year.